This documentary argues convincingly that our animal-based diet is responsible for most of our health problems. 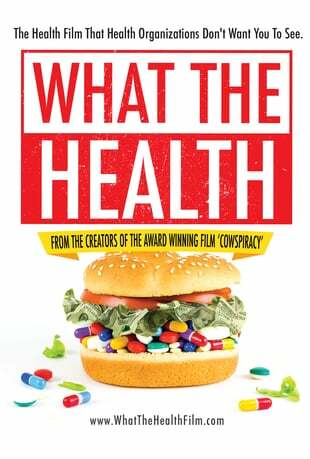 The 90-minute documentary “What the Health“ unveils a new dimension in the conspiracy: we are being farmed like the animals we eat. I’ve seen many films advocating vegetarianism or veganism but usually my enthusiasm fades after a couple of days. I’m from an east-European background and I love my meat, especially sausages and cold cuts. However this documentary made quite an impact on me because it showed convincingly that my animal-and-dairy-based diet is responsible for most of my health problems. A satanic cult such as is Western society makes its members sick and then sells them a phoney “cure.” Our animal-and-dairy-based diet is fuelling a trillion dollar food, healthcare and pharmaceutical boondoggle that is gradually bankrupting and killing us all. We are no different from the factory-farmed chickens and cattle we see in the film. Except we are farmed to be consumers of foods which make us sick, and drugs which only manage the symptoms. We are not supposed to be healthy or get well. The government actually subsidizes and promotes unhealthy diets. Laws protect producers of toxic food and treat whistle blowers as “terrorists.” There is even a “cheese burger” law which protects fast food restaurants from being sued.